Damp Squid reveals how English has always changed, but is now changing faster than ever, and how the Worldwide Web makes it possible to view these changes almost literally as they happen. Why does one little sound cause so many spelling mistakes? Which usages really annoy people, and why? [You can read a sample chapter here: chapter-8-damp-squid. It opens in a new tab. a breezy and engaging look at lots of things we never thought about when it comes to how we speak and why. Surely the title is a mistake? Much of what we learned in those English lessons at school no longer applies. Damp Squid explains how these changes are happening, with entertaining examples. For instance, if an event is disappointing, people, especially in British English, used to call it a “damp squib“—a squib being a type of firework. So the image was of a firework that failed to go off. But as “squib” has fallen out of use, people have replaced it with “squid“. The image in that case is of something soggy, floppy and not very appealing–in other words, a disappointment. Changes of this kind that people make to standard phrases are called “eggcorns“. 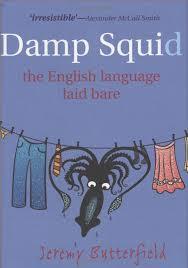 In Damp Squid I’ve used examples of evolving language to show that English has always changed. Before the Worldwide Web these changes were gradual. Now, we can literally see them happening before our eyes.